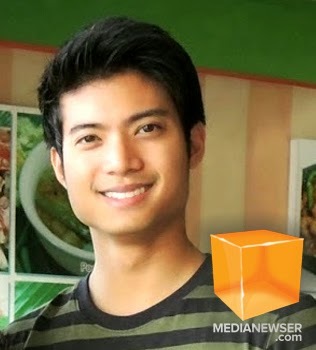 Our Wednesday Cruz caught up with Mikael Daez for an exclusive interview last week in one of the tapings of his "Midnight Express" segment on Saksi. The interview of course had a particular focus: his inclusion to the GMA-7 late-night newscast and his highly praised food segment. When asked how he was able to land the gig on Saksi, Daez recalled: "The segment was presented to me and they (the team from Saksi) emphasized that the goal of the 5-minute segment was to boost the ratings of the whole show." "Natawa ako at first because the ratings mattered and the segment was supposed to turn things around. But I was really up for the challenge because it was supposed to be a 4-week running show only so our MS team did everything we could and we thought was best for that initial run. Then after 4 weeks my executive producer showed me the ratings and we were so happy that the reception of the viewers was really good that is why we are determined to make it more interesting and appealing, when it comes to food, Pinoys can't resist it," he added. >Cruz also asked Daez why his segment is popular among late-night TV viewers. "Filipinos love food kasi and I think that was what made its impact. What is also good about the segment is that who wants to sleep at night after being stressed by the news diba? It's better to dream about food or crave for a midnight snack after a long day at work and after the heavy lineup of news. That is why it clicked with the viewers because it is light and it will get you hungry, Daez said"
You can read Wednesday's full interview with Daez by going on our affiliate website Wednesday Everyday.